THANK YOU for keeping the LGB hobby alive!! And God Bless! Your donation will help in our efforts to have a new blog at least every week! At the Old LGB factory at Saganer Street in Nuremberg LGB entertained a parts department that until today still has to find its match. It was most important to Eberhard and Wolfgang Richter to offer every part that was needed to built their LGB locomotives as a spare part for purchase to their customers. It was in 1968 that they had started their Lehmann Grossbahn manufacturing model trains and at roughly DM 300.00 for a train, A German hobbyist had to spill out the modern equivalent of US$ 950.00 for a Stainz Starter set. It was therefore of utmost importance to provide spare parts on such a luxurious object and preferably at low costs so customers would not loose interest in a hobby that was sort of expensive in the first place. A look at the LGB 2018D blowup sketch of the loco shows the enormous number of parts that goes into e.g. the Mogul (shown is page 1 of 4 pages). And remember, there were no computers, no internet. 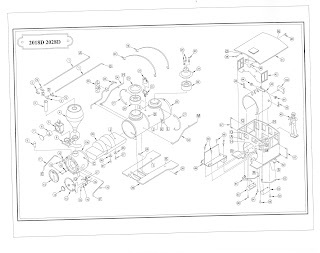 Nothing to help you remember or look up the number of a spare part the customer would ask for. And these blow up sketches were NOT part of the train/loco when you bought it. So, lets say you were missing the bell from the loco. You went and called LGB parts department and said" I need a bell for my LGB loco". Yeah, right. Which loco? Did you know you had a Mogul, a Stainz, a Field Railway loco? This is were Mrs. Grimm comes in. Mrs. Nelly Grimm was the angel of the repair and parts department. She is the wife of LGB head Meister of Production/Manufacturing Rolf Grimm. 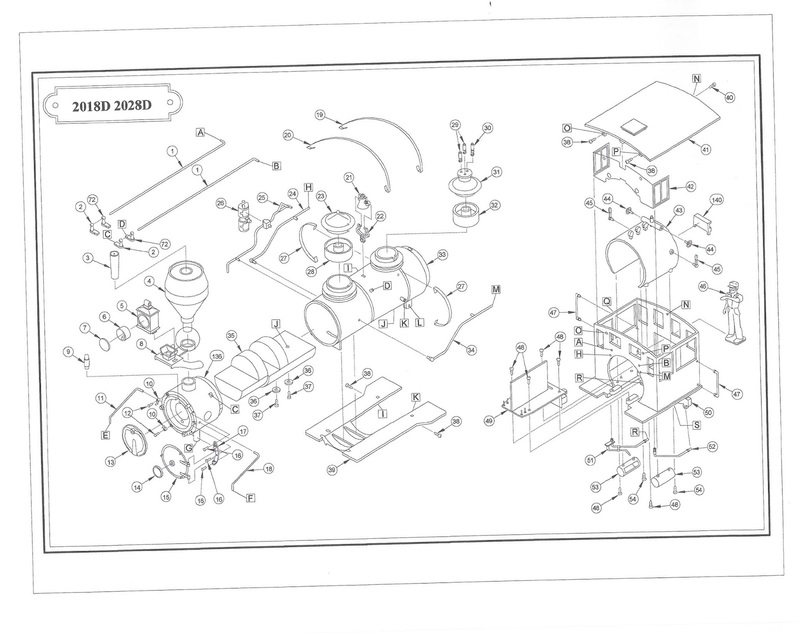 Mrs. Grimm had an extensive knowledge of each,every and any LGB spare part ever made. Not kidding. You lost a tiny screw on the bottom of a Salzburger steam loco 2010- she knew and did mail you the right one. You needed a bumper for the blue electric loco 2030? She knew and mailed you the right one. You called and said:"Mrs. Grimm, My Steyrtal loco (U-Series) has its dome cracked, do you have a new one for me. And she would know to ask,:"Is it the one with the ring around the dome or without?"' and you would get the right part. Mrs.Grimm breathed LGB parts. They were here blood and soul. She didn't have to check any blow up sketch, no manual, no list. She knew them by heart. 50.000 parts. By heart. And that is only for locomotives. Add to this the passenger cars, freight cars and box cars. AMAZING! You can imagine how well liked Nelly Grimm was. 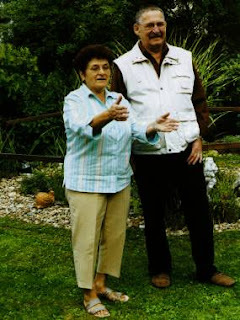 She and her husband Rolf were invited to almost every important LGB occasion. Be it a toy fair, a company anniversary, LGB Club affair, big LGB dealer parties. Wherever the who's who of LGB was invited, Nelly Grimm and her husband where right there at Wolfgang Richter's side. Always humble, always very nice and more than often bringing a self-made cake to the occasion so nobody would go hungry and the event would - for sure - have a "gemütlichen"( homey) feel to it. It might happen that people who collected LGB trains did not know (of) Wolfgang Richter or later his son Rolf Richter as the CEO. But everybody knew Mrs. Nelly Grimm. March 16 1995 was a Thursday. And you ask yourself what made this day special? Well, in world history terms-- mainly nothing. Nobody famous was born or died. Klaus, as you know, is by trade a Lufthansa flight captain for A 340. Now retired, in 1995 he was in the dream years of his career. LH 456 was to fly from Frankfurt to Los Angeles departing FRA around 10.00 a.m. and arriving in LAX around 13.30 or 1.30 p.m.. Klaus had worked with LGB by then for well over 10 years having established close relations with Wolfgang Richter himself and the LGB family. In the early 1980's Klaus was introduced to the Massoth company by Klaus Baumann, then Vice president Sales&Marketing LGB. Klaus had developed and pre-designed the firebox for the Mogul and had built a prototype firebox in a Mogul. Klaus demonstrated this prototype to Mr. Massoth Sr . Mr. Massoth Sr saw this and said: "This has to go to Nuremberg (LGB) instantly. They are working on putting a cab light into a Mogul 2019S and need to see this." 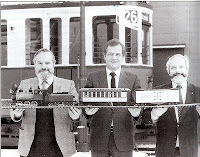 The following day Klaus traveled to Nuremberg demonstrating this prototype to Mr. Ruhland (Head of Molding), Wolfgang Richter and Rolf Richter. The idea was instantly accepted. The Massoth Co. was chosen as the manufacturer for the firebox electronic while Klaus was to deliver a producible reflector for the firebox as to ready the unit for serial production. 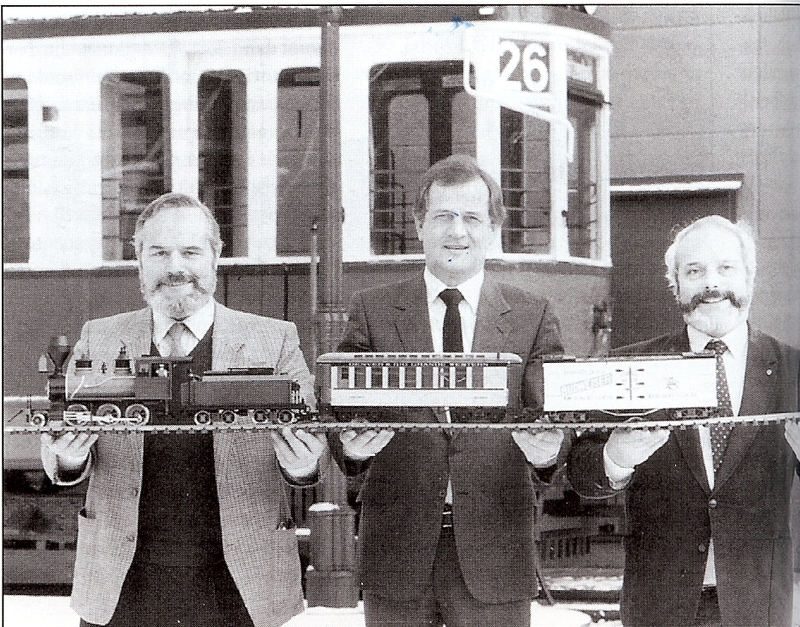 The Mogul 2019 s was the first model train worldwide to feature the firebox light and was presented to the market in 1983. Gradually the firebox light was implemented in many more LGB steam locomotives. So- as you can see, Klaus knew the top tier at LGB quite well as well as the guys at Massoth. Now, Klaus did all this important work for LGB while being a flight captain. As Klaus likes to say:" On some flights you really have time to think a lot. Technical stuff is what I do best next to flying". Fast forward another 10 years when in 1995 Klaus was approached by Christoph Massoth who had joined his father's company by then. Christoph wanted to accompany Klaus on a special flight from Frankfurt to Los Angeles with the goal in mind to get some sound recordings. The focus was on Disney Land in Anaheim/CA which featured a real life Mogul. The sales rep for LGB of San Diego had worked out the meeting arrangements. 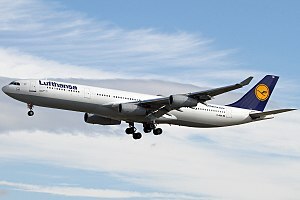 Christoph was to fly on a so-called 'cockpit-ticket' which put him in the observer seat behind the Captain and Co-pilot in the cockpit of the A 340. While boarding Christoph told Klaus "Somebody else is on this flight today who we both know" and pointed out Rolf Richter among the passengers ready for boarding. Rolf was to fly to San Diego on a regularly booked First Class ticket and was completely unaware of Klaus being the Captain and Christoph being another passenger. There you have it. No multi-billion company does permit what happened on March 16, 1995 : 3 men who did and were to impact LGB in awe-inspiring, extraordinary and also shocking ways on the same flight to further the abilities of LGB trains. And to top it all off Klaus did invite Rolf into the cockpit for landing. The Disneyland visit was later cancelled due to repair problems with the Mogul. 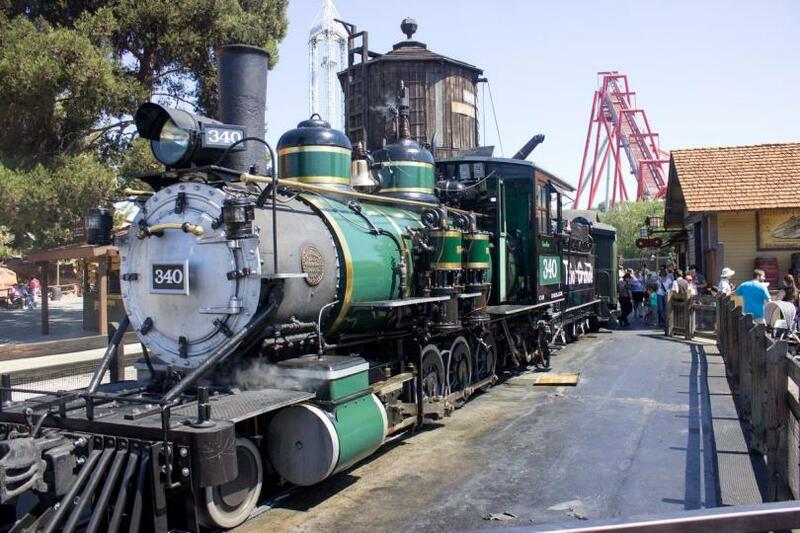 So Klaus called Knott's Berry Farms and was able to arrange a visit and recording admission for Knott's Berry Farms' real life narrow gauge steam loco in their amusement park. Rolf Richter left Klaus and Christoph to see to his LGB business in San Diego. Rolf Richter passed away in 2009. Christoph Massoth retired in 2012 from Massoth Co. and went into sheep breeding and herding. And Klaus? Klaus retired from flying in 2001 and went to establish a series of technical companies of which TrainCraftbyKlaus is still active and operating. As of March 2019 Klaus is again open for installation, restoration and repairs of LGB trains. Call him for an appointment for your LGB treasures. And please check out our blogs TrainCraftbyKlaus and TrainCraft Trove. The following is a translation of "The LGB Collector", an article by H.-Jürgen Neumann from Spring 2006. Mr. Neumann published it in his own IIm-Online News web page. You can read the original article at http://www.lgb-much.de/20406.pdf and use a Google translation or similar. To avoid mixing-ups in context with Yours Truly you will find "(HJN)", the abbreviation for H.-Jürgen Neumann, in places were the original author refers to himself since the article is about his lifelong journey being a dyed-in-the-wool LGB fan. A collection of special trains or Starter Sets may have its own charm. At least as long as one doesn't buy huge volume of one kind (of loco) and store it in the basement hoping for increasing value overtime. There were some fine trains out there like the Pinzgau train (LGB# 20520) or the Furka-Oberalp train (LGB# 20512) mirroring the archetype nicely. Optically pretty 'advertising' trains were the Nürnberger Lebkuchen train (LGB#20526 - Nuremberg gingerbread train), the Philips Train (LGB# 20412) as well as the beer trains Lütgenau (LGB# 20536) and Schweiger (LGB# 20539). Then there were special train(sets) for the American market like the Marshall Field Train (LGB# 20534) and the Dodge City Little Billy Train (LGB# 20701). The Red Train (LGB# 20401 RZ) and the Blue Train (LGB# 20301 BZ) were supposed to tie in with the success of the Anniversary train (set) which to some degree they did. There were many, many other train sets; and the Lehman factory did not like at all the fact that quite a number of sets went straight into the basement of collectors rather than into the living rooms of LGB beginners. Regarding this subject my opinion has always been that LGB could very well afford to 'give' the collector a highly subsidized train set once in a while when they were making good money out of him (all the other time of the relationship). Sadly, the long planned LGB-Museum in Nuremberg never realized. When the factory extension was built on to the existing LGB lot in the early 90's a museum was part of the planning but sadly wasn't built. Now other things are more important...(remember, this article is from 2006. In 2012/13 the famous Spielwaren Museum= Toy Museum Nuremberg added a wing for LGB which is serviced and managed by the LGB Booster Club. See LGB Yarner blog 05/2013). Twice in the past there was a " LGB-Museum" at convention boothes, once in 1988 - 20th anniversary LGB- and in 2000 jointly with Uwe Klöting at the International Train Show in Cologne. I (HJN) furnished and managed both which was a lot of work as well as a great honor. The driving stock out of these estates are often unfit to go into or extend collections. They have been played with - which they were destined to be, not to forget. Often, driving stock from outdoor layouts was intensly operated; meaning they suffered from weather, screws are rusty and the plastic became brittle or broke off already (parts). In case very rare pieces are part of such a layout (collection) one can try to buy those and restore them. But even the repair department of LGB at the factory - which brought new shine to old driving stock in years passed - have now run out of historic spare parts. Some (collectors) buy bad looking items at a flea market just to use them as spare part provider. Maybe the (LGB fan) who has a nice historic LGB portfolio should start thinking about how and to whom he wants to pass on his collection. To see these items end up on eBay is just a pity. I do hope I was able to take you with me on (my) journey into the world of LGB and want to focus one last time on our (LGB Friends of Much) motto: "back to the roots". To quote a famous citizen: "there is magic in all things new" and I say " but also in many old things, too." Just like no one would get the idea to collect modern cars they do like to see Oldtimers in their garages. They (oldtimers) represent craftsmanship and their engineering is traceable. They are just like-able and something special. Just like you can transfer this thought to LGB ; back to the roots - wholeheartedly and with enthusiasm. Fine example of the work scope of the"Design Tuning" department. Matching the LGB car "VWSport" the Diesel loco was made by the department. Special limited edition of 3. (....utilizing the LGB 'tuning department') I had a specialty loco made for me matching my VW-Sport freight car # 4090VW, based on the Diesel loco 2062 and thus had a beautiful complete trainset. Some of my color 'options' like the duo-colored, green/brown and the complete on brown Saxonian car LGB# 3050 were adopted into the LGB product line. The complete gray (car) is still a specialty in my Saxonian train(set). Nowadays there a collectors who chose their special subject. "Coca-Cola' is one typical example and such cars were bought in addition by those who collect everything Coca-Cola not just model trains or LGB. It was the same for items with teddy bears regarding the Steiff collectors. Collected were: tank cars of every (labeling and color) description, beer cars as well as the various kinds of "Stainz" and her sisters. LGB fans who concentrated on a specific theme on their layout - I don't identify them as collectors. 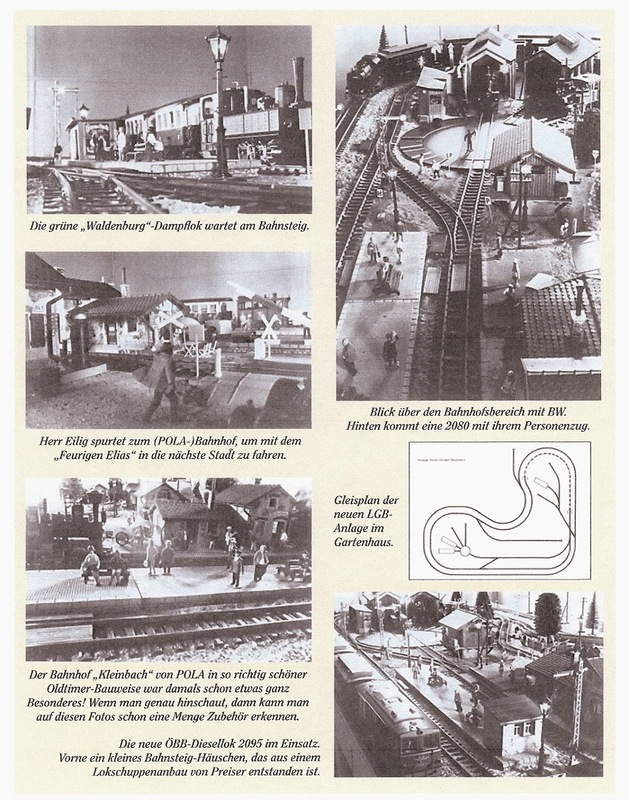 They rather operate a layout modeled after the Swiss theme, Austrian or German State Railway. And last but not least, technical advance turned some older models into " passé " models. On a fully digitized layout some of the old locomotives from 1968 don't even operate anymore. And digitizing them would inevitably damage their collectors value. Those who stocked up on green and red Crocodiles in the early years will discover upon trying to sell them today that they are compared to the newer ones with digital driving and sound decoders - and not necessarily to their advantage... This led to a considerable decrease in collecting. At least for driving stock manufactured in such big numbers that they are not considered a specialty in the collector's mind. But there are still exceptions; I am thinking of the LGB Club Rhein/Sieg special cars for their annual meetings with editions of 100 each. Also, editions of 1,000 worldwide are still considered low from a collector's standpoint. Surprisingly, lot size(s) don't always have a significant influence on the (collection) value. The LGB Anniversary Trainset 1981 edition was 20,000 and still increased in value sharply during the following years. Cars by Lütgenau or Roskothen with mini editions of 100 did not show any upward trend. Then again, they don't come on to the market, really. (To define )Collector's values isn't quite easy. 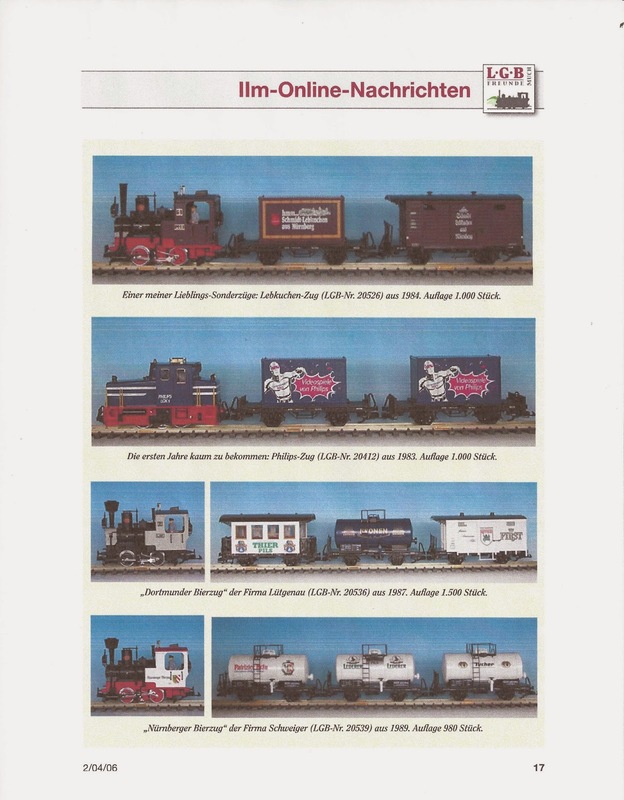 There are collectors' catalogs of which the "Christmann Collector catalog" (out of print since 2008 or so, today's "manual" is the "Kompendium for LGB Collector and LGB Friends" 2012) ; but prices printed in there can only be reference points. First of all the condition of a loco is crucial; second someone missing a (loco) in his collection and really wants to have that will be more apt to pay a higher price. And on the seller's side one has to to go the extra mile and look for that person. Within the last years the auction-house eBay has establishes itself in this area. It is really very interesting (to see) what (kind of ) LGB driving stock is offered there. But, the condition is important and if that can be determined by looking at it - I dare to challenge that. This was actually the end of the 'collect-everything - collection'. In addition, the yearly quantity of new items grew into infinite numbers and became unaffordable. This comes to show how important it is for long-term success to have a marketing strategy and marketing psychology, knowledge about your customers' wishes and their sensitivities; hence, the dramatic drop in sales for some model train manufacturers is mostly 'home-made' within the last few years. 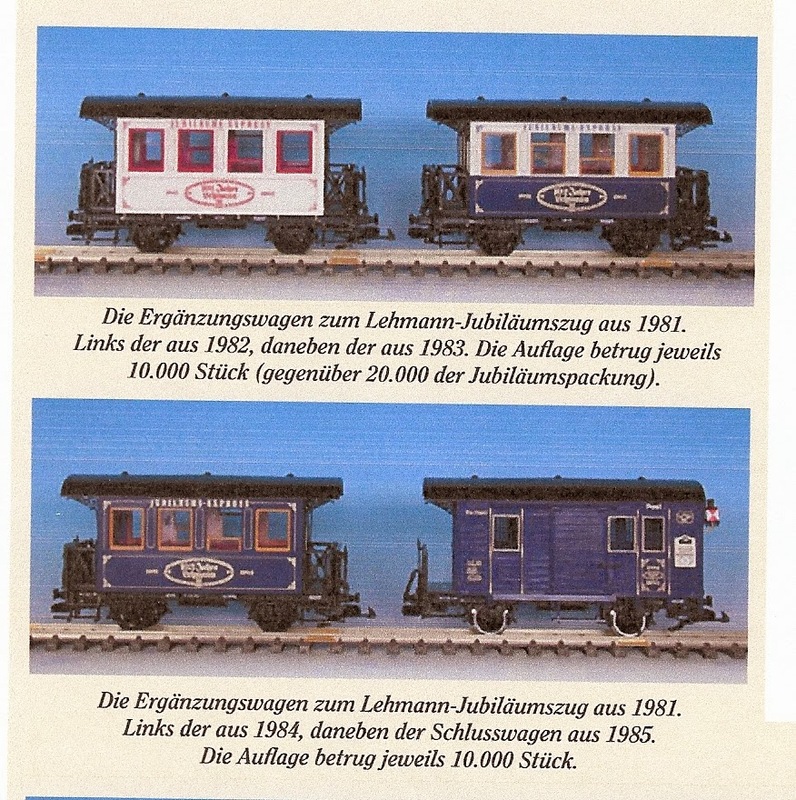 Top: Anniversary Train " 100 years of Lehmann" from 1981. Despite a big edition it was special. More cars were added on in the following years, see below. Bottom: The anniversary cars "1,100 Years City of Duisburg" from 1983 displays advertising by Roskothen company on the other side of the car. Limited edition of 100 makes it a rarity in every LGB collection. During the 'hot' years of collecting some freeloaders tried to hop on the LGB train, as well. Big dealers had their "own" train manufactured at the LGB factory or "their trains" like "Schweiger" company in Nuremberg, or the Lütgenau company with their "Dortmunder Bier" beer train. It sure was triggered by the success of the LGB Anniversary Train of 1981 which was issued for the "100 Years Ernst Paul Lehmann". Already the optics prove that the "100 Years Lütgenau" anniversary car (LGB # 3007Lü) as well as the "1,100 Years City of Duisburg" by the Roskothen company were just trying to get a piece of that act. (By the way, edition of 100 cars each). And LGB itself hopped on that bandwagon -again- with their next four "Car of the Year" models to go with the Anniversary train. 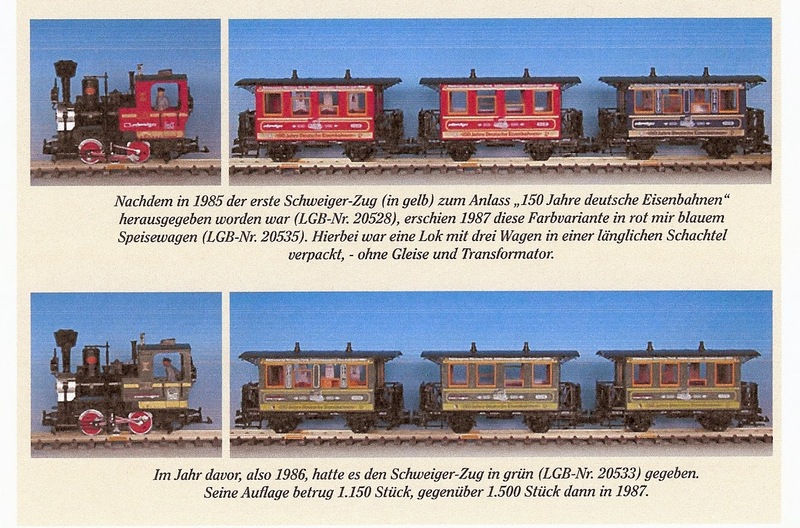 Top: After the first Schweiger train was issued in 1985 (in yellow) on the occasion of "150 Years German Railroads" LGB# 20528 this set was issued in 1987 in red with a blue dining car (LGB# 20535). The loco was packaged with these three cars-without track or transformer. 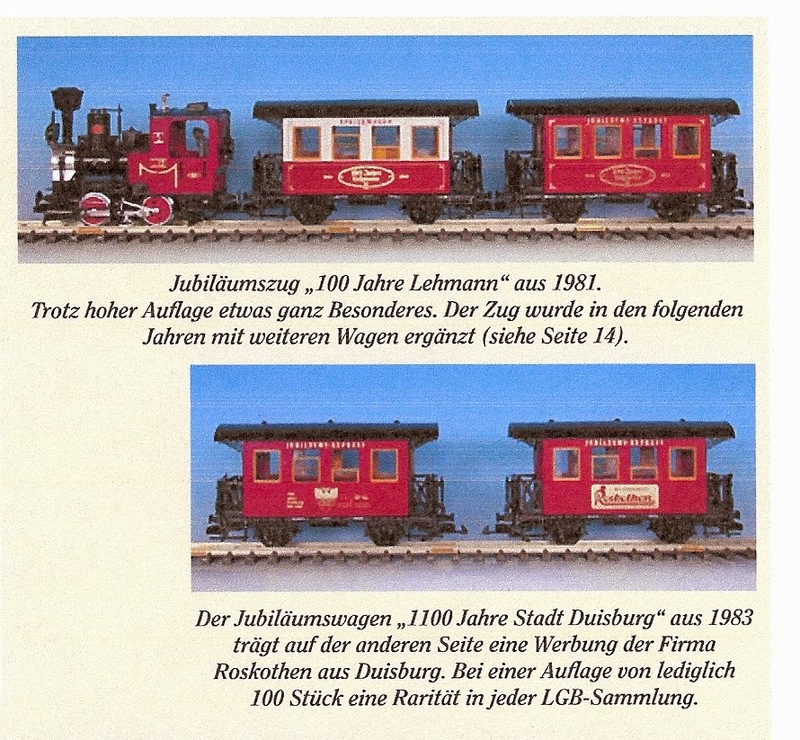 Bottom: A year earlier, 1986, the Schweiger train came in green (LGB#20533) edition of 1,150 and 1,500 for the 1987 version. 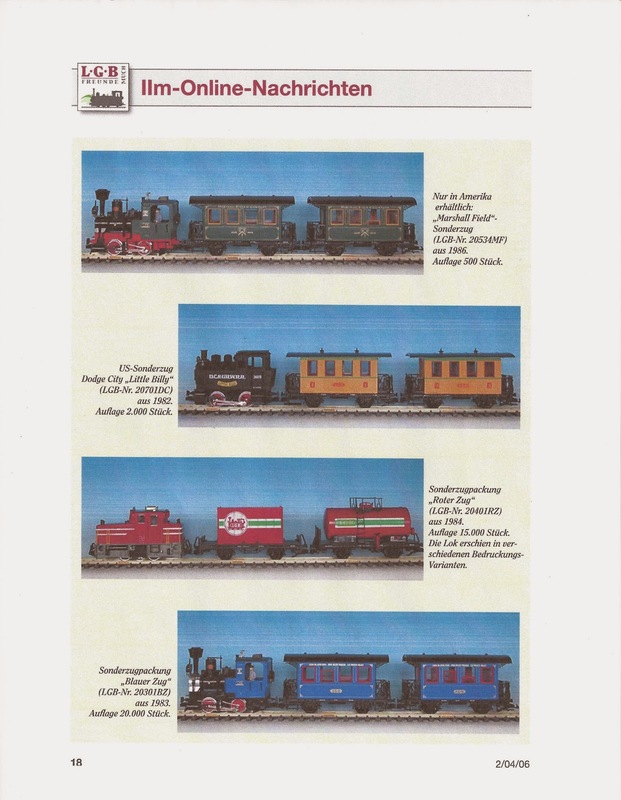 Top:The add-on cars for the Lehmann anniversary train from 1981. The left car is from 1982 right from 1983. Edition 10,000 each while the anniversary train had 20,000 made. Bottom: Add-on car to the 1981 Train set on the left from 1984 and on right the end car 1985. Edition for ea. car 10,000. Private workshops manufactured quite a few number of novelties and oddities, container trains and -cars, hinged-lid cars with engravings, paint jobs and re-labeling (with some really professional outcomes) and other driving stock. While some got their blessings for their 'work' from LGB (like the Baumann of Neustadt /Aisch company and their re-painting-jobs) others drew the anger of LGB when repainting complete series of small electric locos. Not without reason regarding the harsh liability laws especially in the USA that had to be followed. Top left: The Florsheim freight cars from 1982 with an edition of 500 for the US market, a grand rarity today. Top right: the specialty car "Stuttgarter Hofbräu" was a 'private initiative' and not made at LGB factory. Bottom left: new in the LGB program: LGB delivered the basic package # 20531, the design for the container was up to private initiative. Shown here is a well done variation "Capri-Sonne" by the Schuhmann company (Capri Sonne was an orange based lemonade brand in Germany). Edition of 100. 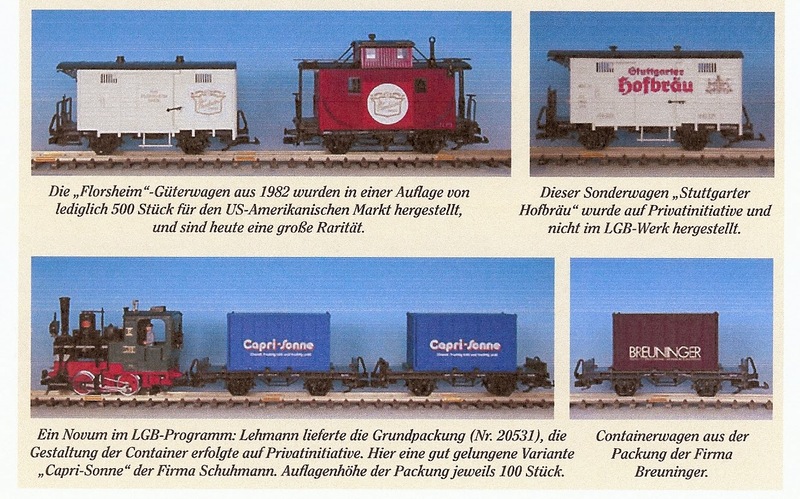 Bottom right: container car from the package of Breuninger company. Then, at one time the base frame was done, tracks were laid including a Staging yard ( or Fiddle yard; a collection of model railway tracks that are invisible to a viewer) . Then fate interfered: in 1985 I founded the LGB Club Rhein/Sieg and at the same time the Club magazine "Spur II Nachrichten" (Gauge II News) with the very first issue focusing on collecting; which in later issues was taken up again and again and also reporting about things past and currrent issues. Regarding my basement layout - it was sort of neglected due to my many tasks for the Club and the magazine and sort of still looks the same today as is did back then. Spanning 20 years now my task was to organize Club meetings, appearances at conventions, Club travels, memos, membership management and administration and many more. The magazine required the biggest time input since I wrote many articles myself and I spend many evenings editing, layouting and publishing the magazine. (In 1985 there were no PC's and cheap printers to help with publishing, all work-type,composition,drafting, had to be prepared before going to a printing press. That didn't change in Germany until the late 90's). Always being pressed for time to publish an issue by mid year and at the end of a year. The magazine "Spur II Nachrichten" gained an excellent image over the years. It was independent and critical, calling things by their name which didn't always go well with the person in focus. But all criticism was always factual and objective and predominantly right on spot. After 20 years, in 2005, I decided to pass on the leadership of the Club into new hands and chose as my successor(s) a board of active club members - it was quite a relief from all that work. And I felt that even more when the new board decided in 2006 to cease the magazine due to costs and other reasons and publish a new magazine under their own management. This decision led to a huge alleviation for me even though I also was feeling a bit of sorrow as did many of the readers. Well, back to the subject of collecting. (In the 80's)When I was working for a big auditing firm and traveled all of West Germany and West Berlin it set the perfect stage for collecting LGB trains specifically those who were from the early years and were no longer manufactured: I was traveling to many big cities and could stroll through the toy stores right after work; and back then I had a lavish allowance for my travel expenses covering my financial needs. I remember it very well being in Mannheim purchasing 6 green BP tank cars. In today's money a very good investment! Flea markets and toy markets also offered interesting old items. Always sought-after were the little plain colored electric locos and the first locos with "Heuler" motors. Pieces like the old tank cars were readily purchased. When the 'old-timers' were no longer available the collecting fervor diverted. First people looked for color variations. Lehmann (always) took quite some liberty with their color schemes. A car that was just painted in light red came in medium red with the' next edition'. The labeling showed many discrepancies, too. Passenger coaches were labeled in Arabic numerals then in Roman numerals. Labeling was done with labels, then by embossing, then by pad printing. Primus 1977-78: blue Diesel loco # 20860 followed by a black Shell tank car # 40860 and a Coca Cola car # 40832. The "8" inbetween the LGB number was reserved for Primus. Left: The first Coca Cola Specialty Car # 4072 issued in 1985 and was much sought-after from the start. Limited edition of 2,000. At one time models were sought after that were made exclusively for the US market, for other foreign countries, or in limited editions. A red Old-timer Street Car for Austria, a red-white streetcar passenger car "Chocolat Suchard" and in particular the driving stock of the "Primus" series built from 1977 to 1978 became exciting - and about which I (HJN) will write a special article in the near future (which Yours truly will translate and publish here as well in our near future). Many models for the US market could only be sold in the USA due to concession and royalty reasons. I do very well remember the first "Coca-Cola" car LGB # 4072 issued in 1985 that was highly sought after and highly paid for here in Germany. Then there was a "Orient Express" LGB# 20277 consisting of a gray steam loco of the "U"-series and 3 different coaches (base car was LGB# 3062) and was almost unknown here (in Germany). Of course a vivid bartering ensued with LGB friends in the USA. Huge quantities of "old-timer stuff" was purchased here in Germany via intermediaries and shipped to the USA. At the same time collectors here procured US specials via acquaintances directly from the USA. It wasn't always perfect due to the long transportation route (America and back) transport damages happened easily - but what were one supposed to do? Broken grab bars on the Coca Cola car and bruised rivets on the Orient Express cars can tell a thing or two about this. Calling on LGB company to establish a kind of "Collector's Service" went "DOA". One of the reasons for that was that 'collectors' were synonymous with 'scalpers' which was in part due to our American LGB friends since their profiteering with LGB models was quite obvious. ( Note from Yours Truly: what we Americans call having a smart sense for business is often already understood as profiteering in German mentality). The most startling stories were told - about LGB rarities stock-piled in bank safes and many more. In 1975 I moved back into my parent's house in Wuppertal, the city of my original upbringing. A garden shed was part of that property which I annexed instantly for my LGB purposes. There I established my first real layout on a plywood board. The LGB Depesche published photos in issue 31/32. Accessories at hand at that time are clearly recognizable. A train station and a freight shed by "Lindberg", loco shed, small freight shed and platforms by "Preiser" (who unfortunately did not continue with their product program). The ramps are by "Kibri" , they are displayed on the upper photo on the right. An oldtimer car by "Schuco" (which is now owned by the same people who now own LGB) is waiting at the railway crossing gate. Bottom: Small freight shed by Preiser on left. The train station lamps deliver a romantic light. I won runner-up with this layout at a LGB at a LGB photo-competition! Again, the LGB Depesche reported about this see magazine # 35 from 1978, pages 18 to 21. 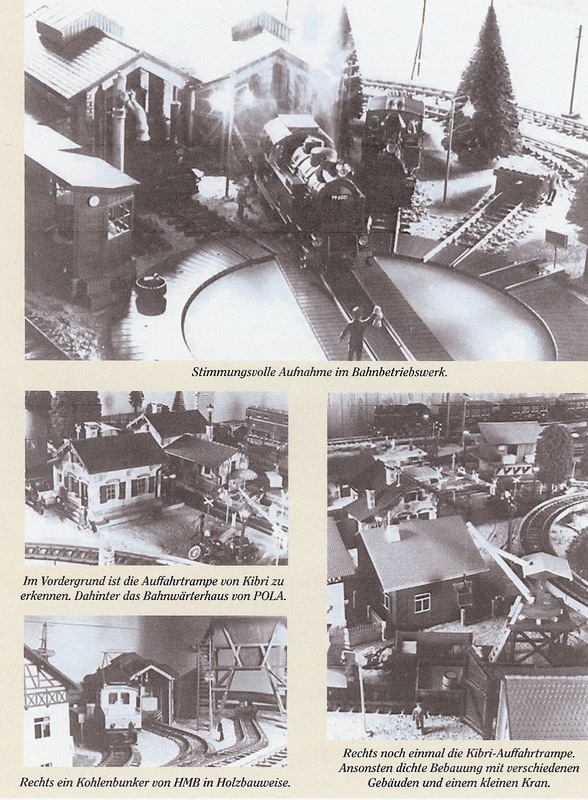 By then the "Lindberg" trainstation was replaced by the 'Kleinbach' by "POLA", also a lineman shed by POLA, a coal silo and a small crane by HMB as well as many added LGB locomotives and cars. clockwise from top left: the green "Waldenburg" steam loco waits at the platform. View of the train station area with BW-in the back a 2080 w passenger cars is approaching. Layout plan of the new LGB layout in the garden shed. The new OBB Diesel loco 2095 at work- in the front a little platform shed deriving from as loco shed addition by Preiser. The "Kleinbach' train station by POLA, the wonderful old timer structure was something special back then;look closely and you can see a lot of additional accessories! Mr. Speedy hurries to the (POLA) train station to take the Fiery Eli into the city nearby. In 1979 I moved from Wuppertal to Much. I worked in Cologne at that time and wanted to built a home-house. Via the "Koelner Stadtanzeiger" (Cologne newspaper) I found a piece of land in Much -until that time unbeknownst to me - about 30 (car) minutes from Cologne. The property measures 1,200 square-meter (roughly 1/4 acre) and would have been non-affordable within Cologne city limits. Right-away I told my architect that I needed a train-basement. So he planned a basement room covering the complete length and width of the house : 11 yards by 5 yards. But it took another 5 years until I could start building my layout. First, this room got used as storage room right after moving in and then I had other things to do, landscaping my backyard and other chores. clockwise from top: atmospheric shot in the depot.- On the right the drive-up ramp by Kibri, dense housing with several buildings and a small crane - Coal silo (on right side in photo) by HMB made out of wood.- Drive-up ramp by Kibri (in front) behind that the gatekeeper shed by POLA.